MEYLE suspension and damping parts – built to make a difference. With MEYLE shock absorbers you won't even notice the bumps. All system components are matched to work perfectly in tandem. Hard-chromium plating and maximum surface hardness combined with minimum surface roughness of the piston rods make MEYLE shocks exceptionally long-lasting. All MEYLE springs are manufactured from cold-formed spring wire featuring long-lasting anti-corrosion protection (powder coating) designed to withstand even harshest operating environments. 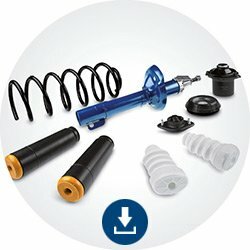 Damping performance guaranteed: MEYLE shock absorbers for vans. Maximum surface hardness combined with minimum surface roughness and hard-chromium plating of the piston rods are default MEYLE features. Visibly superior quality – MEYLE shock absorbers put to the salt spray test. about suspension and damping as download files.